The root of biennial herbaceous plant Isatis indigotica Fort. of family Cruciferae. Shaanxi, Hebei, Jiangsu, Zhejiang, Anhui provinces, etc. of China. Light smell, slightly sweet, bitter and astringent taste. Straight, thick and even root, solid body with enough mealiness. Bitter, cold; lung, stomach, heart and liver meridians entered. Clear heat and remove toxicity, cool blood, alleviate sore throat. Ban Lan Gen and Da Qing Ye are both from the same plant-Isatin, but the medicinal parts are different. They are similar in aspects of properties and effects: clearing heat and purging fire when entering qi system, and clearing heat and cooling blood when entering blood system as well; both of them are widely indicated for each stage of warm diseases, and exterior syndrome of external contraction of wind-heat; they are also commonly combined together in treating mumps, erysipelas and fever with swollen head due to warm-toxicity for mutual reinforcement. 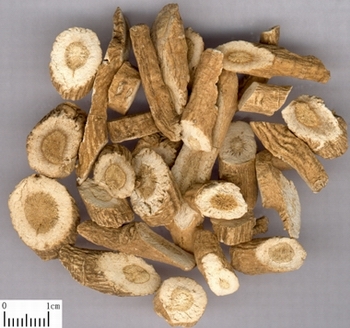 Although its action of cooling blood and removing macula is not as good as that of Da Qing Ye, it is specialized in removing toxicity to alleviate sore throat and relieve swelling, so it is suitable for treating initial warm diseases or external contraction of wind-heat characterized by fever and sore throat. For example, it is used in Gan Mao Tui Re Chong Ji from Pharmacopoeia of the People's Republic of China published in 1990; and also it is often combined with herbs good at dispersing wind-heat to improve the effect, such as Bo He, Jin Yin Hua and Lian Qiao, etc. For warm diseases in stage of dual blazing of both qi and blood or heat entering nutrient-blood manifested as high fever and macula, it has the action of clearing heat and removing toxicity, cooling blood and removing macula, and it is often combined with other toxicity-removing and blood-cooling herbs to take effects of clearing heat from both qi and blood systems. For example, it is combined with Huang Qin, Zi Cao and Sheng Di Huang in Shen Xi Dan from Wen Bing Tiao Bian. 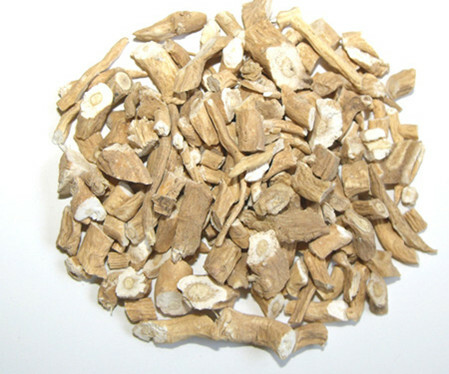 It is good at clearing heart and removing toxicity, clearing heat from lung and stomach to alleviate sore throat and dissipate nodulation, and is commonly used in treating red swollen and sore throat, red swelling and pain of both cheeks which are all caused by interior excessive heat-toxicity, attack by epidemic toxicity or wind-heat. It can be used singly or combined with wind-heat-dispersing, toxicity-removing, and sore-throat-alleviating herbs, such as Niu Bang Zi, Xuan Shen and Jie Geng, as in Pu Ji Xiao Du Yin from Dong Yuan Shi Xiao Fang (Dongyuan's Effective Prescription). In addition, for its actions of clearing heat, removing toxicity, and cooling blood, it is also suitable for treating sores and swollen and pain abscess, red eyes, hematemesis and epistaxis due to blood heat. Decoct 15~30 g, or 60~120g as the large dose; or make into pills, powder. Proper dosage is for topical administration.